The Aston Homes design team work hard to create spacious and contemporary floor plans and we’d love for you to get to know them a little better. In today’s blog, we showcase one of the more cosmopolitan designs – the New York! Are you looking for a floorplan to suit a growing or established family, or enjoy regular entertaining? The New York design perfectly represents the fine balance between precious time spent together and the need for personal space. A generous size at 28.16 sq, the New York offers four bedrooms, two bathrooms, an open planned kitchen meals lounge, a home theatre and a kids’ retreat. The large windows throughout allow for a flow of natural light that accentuates the versatile living space, while beautiful, high-end finishes ensure you will always enjoy coming home. Upon entry you are greeted by an impressive master bedroom with a large concealed robe. The adjoining master ensuite features a large walk in double shower room complete with rainfall shower heads and other special details you would expect in a 5 star hotel. The theatre room is well positioned to allow late night sessions without disturbing the other inhabitants of the home. The further three bedrooms (all 3x3m or larger) are positioned down a private wing of the home, ideal for visiting family members, friends, or kids! The space where these three bedrooms meet has officially been dubbed the ‘kids retreat’ – a room for the kids to play, learn and make their own fun – but is just as serviceable as a relaxation zone for adults or teenagers! With beautiful finishes, plenty of light and a butlers pantry – you’ll enjoy making every meal in your brand new kitchen. Meals can be enjoyed inside in the meals area, or outside in the undercover alfresco area which can be enjoyed all year round – for a lengthy weekend brunch, while keeping an eye on the little ones playing in the backyard or under the stars come nightfall! 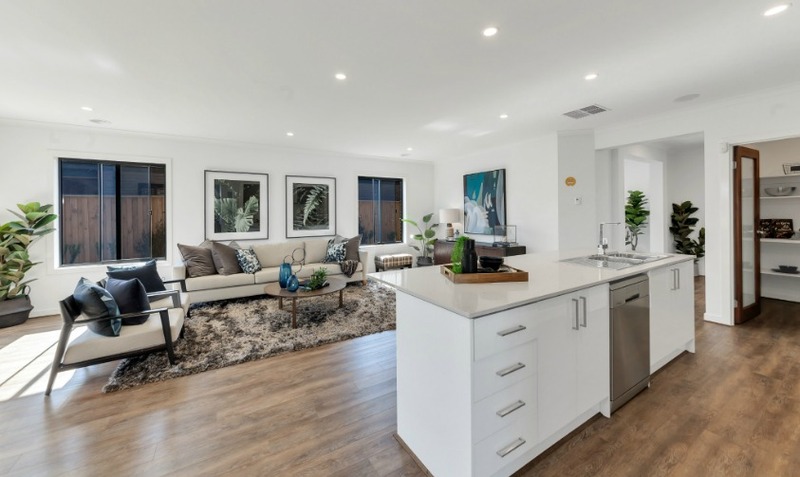 You can visit the New York on display at the Aurora Estate, 50 Barham Way, Wollert. Our doors are open from 11AM to 5PM daily at both of our display locations. You can check out our facades and floorplans here.